The legend of Jimmy McOuat lives on through the magnificent three-storey castle he built on the shores of White Otter Lake. 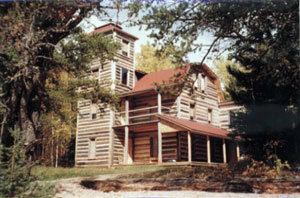 At the turn of the century he single-handedly constructed the log castle from red pine logs that he cut, hauled and interlocked. The castle has recently been restored through the efforts of the Friends of White Otter Castle. The castle is 64 km north of Atikokan and is accessible by boat, plane and snow machine. 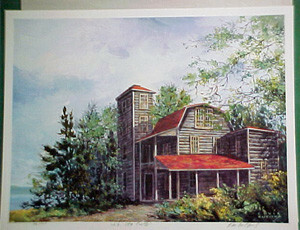 The White Otter Castle is on White Otter Lake, which can be reached from Clearwater Lake. Clearwater Lake butts against Highway 622, north of Atikokan. Topographical maps can be purchased from Walt’s Dry Goods in town. They can give you specific directions as well. In the winter, the Atikokan Snow-Ho Club maintains a trail to the lake. White Otter Castle PrintLimited edition prints of White Otter Castle are available for purchase at the Atikokan Economic Development Corporation’s Office. Prints are sent via Canada Post – individual prints shipped in protective tube.